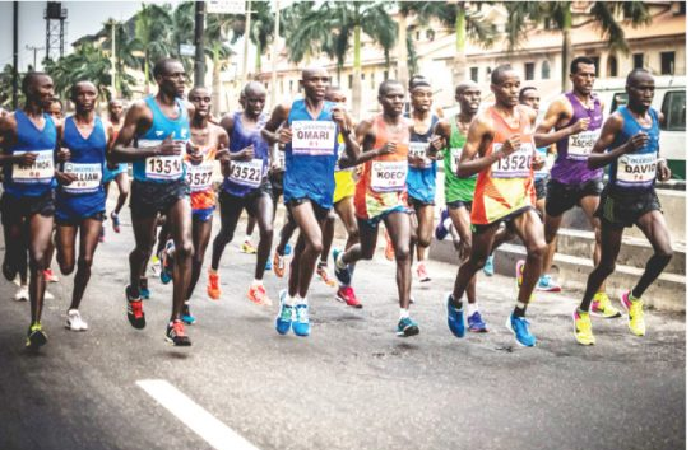 The recently held Access Bank Lagos City Marathon 2019, the fourth edition since it commenced in 2016 saw Sintayehu Legese, an Ethiopian emerge first finishing the race in 2hrs 17 mins, while Joshua Kiprotich a Kenyan came second in 2hrs 18 mins. For Legese his prize money for 1st position was $50,000 and Kiprotich, $40,000. They defeated over 50,000 participants from different countries including Nigeria the host. The preparation for a marathon is different from that of a 100 metres, 200 metres race which are short distances. A marathon is a journey of endurance which is why usually those who run short distances and some others who think that going to the gym to shed weight without getting used to jogging or running long distances find it difficult when embarking on the competition. Those who win don’t begin by sprinting like Usain Bolt when they haven’t gotten to half of their journey. They start on and gradually increase their pace till the finish line and after winning the preparation for the next competition begins immediately to keep their body fit and ready ahead of time. A couple of Nigerians enraged at the dominance of the Kenyan and Ethiopian athletes who are world champions and winners since the marathon started three years ago began running as if it were a 100 metre race for a distance of 42.5km and when they got to Third Mainland Bridge which is about 15km from the start point, many collapsed and couldn’t continue. When Jeff Bezos began Amazon in 1995, he just wanted to create a wonderful customer experience for people to get books online. Twenty four years down the line it became a $1 trillion company selling virtually anything and offering more advanced products which helped it scale like it’s cloud computing services AWS which is the global market leader. Sergei Brin and Larry Page created Google as their Phd thesis to find a better way of providing search with algorithms better than what Yahoo the dominant leader then was doing. Today more than fifteen years since their first version was released to the public over a billion users use Google’s Gmail, Youtube, Android Operating System, Google Cloud, Google Drive and so many much more products. It is important to note that the two companies aforementioned were not earning money immediately they launched or profits on revenues. For Amazon it took a long period before their profits started coming because e-commerce is a business which takes time to scale due to issues around logistics, trust from potential customers and supply chain. But those who invested in the brand saw and admired Bezos vision for the bigger picture he wanted them to see and kept faith. In Nigeria and Africa, infrastructure to help entrepreneurs scale is a major problem. This is the major reason for high mortality rate of startups on the continent, and due to the poverty prevalent, most entrepreneurs when they commence new ventures feel discouraged when the money doesn’t start coming immediately as capital is scarce and investors here lack the patience like their counterparts in Silicon Valley and Beijing, the two top startup ecosystems in the world who can keep on funding startups for five years and wait for them to start earning revenue and be profitable. African entrepreneurs and investors can learn from marathons to endure the hard times and keep on supporting and developing the venture until it succeeds as both parties will celebrate the success when it arrives.